When this card enters play, choose a Troublemaker. You may put a number of 1 power Yellow Critter Friend tokens into play equal to that Troublemaker's power. 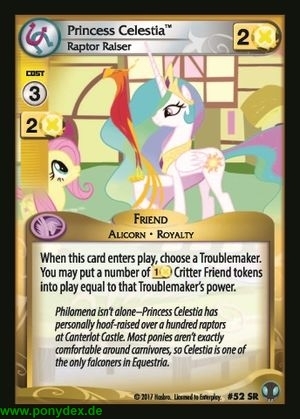 Philomena isn't alone-Princess Celestia has personally hoof-raided over a hundred raptors at Canterlot Castle. Most ponies aren't exactly comfortable around carnivores, so Celestia is one of the only falconers in Equestria.